If you're new to this blog, you may want to subscribe. Thanks for reading Vegetarian Frugal Housewife! Today is THAT day. Black Friday, the most evil, spendthrift, Chinese-import shopping day of the year. 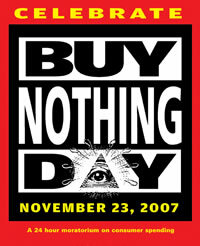 Some of those “Green” types of people started a little thing a few years ago called “Buy Nothing Day.” in the spirit of which I thought I would post on my plans for making more gifts this year than last and then (hopefully) more again next year as well. Why? Well what gifts do you remember from childhood? The handmade ones right? And what stuff do any of you still have from your childhood? If anything, I bet it’s handmade. Gift-making ideas can include candles, soaps, jellies, wine, hats, purses, blankets, beaded necklaces, tree ornaments, even your cards that you mail out during this festive season. Nothing is off-limits. I will be including handmade soaps in peoples Yule stockings and also like to give crocheted hats, blankets and scarves made from luxurious natural fiber yarns. We’ll see how much I actually end up making by hand this year. No matter what percentage of the gifts are store-bought you can bet that you won’t be bumping into me in a Walmart. Go on, have fun, grab some yarn, some glue, some glitter or some clay and make something for a loved one. I’m certain that it’ll make more of an impression than that designer golf shirt. Show your appreciation for my work by donating a little to my pocket fund. Vegetarian Frugal Housewife © 2019 All Rights Reserved.